This image shows a high-resolution heat intensity map of part of the south polar region of Saturn's moon Enceladus, made from data obtained by NASA's Cassini spacecraft. The map reveals never-before-seen details of warm fractures that branch off like split ends from the ends of the main trenches of two "tiger stripes." The features nicknamed "tiger stripes" are long fissures that spray water vapor and icy particles. These two fissures, Cairo Sulcus (left) and Alexandria Sulcus (right), extend to the lower right, off the bottom of the image. 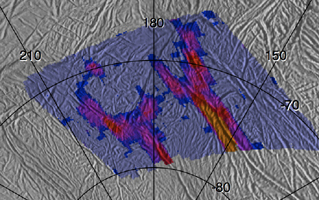 The map also shows an intriguing isolated warm spot, shown in purple-red in the upper left of the image, that is separated from other active fissures. The thermal data came from Cassini's composite infrared spectrometer during an Aug. 13, 2010, flyby of Enceladus. 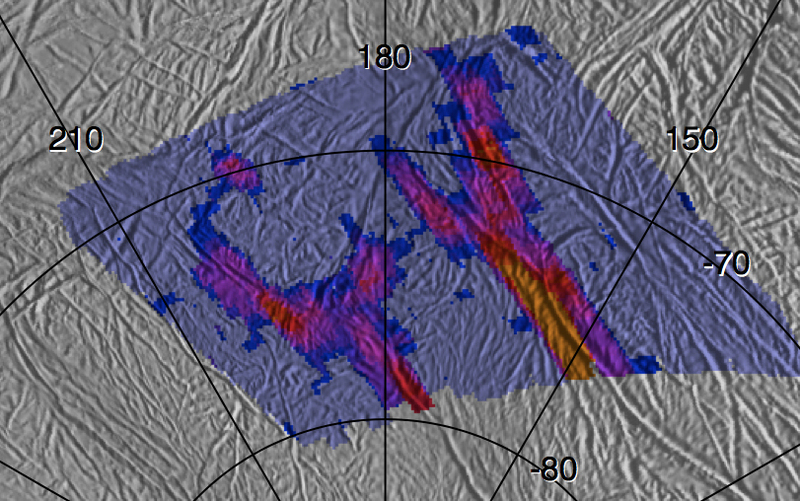 Scientists overlaid the data on a background map of that region made from Cassini images taken in July 2005. The intensity of thermal radiation, measured at wavelengths from 12 to 16 microns, is color-coded, with dark blue, purple, red and orange denoting progressively more intense radiation, due to higher temperatures and/or larger expanses of warm material. The pale blue color indicates regions that were mapped but that were too cold to emit significant radiation. Alignment of the thermal map with the underlying base map is approximate. The map shows a region approximately 130 kilometers (80 miles) across. These data were obtained as winter darkness began to engulf the south polar region of Enceladus. Away from the warm tiger stripes, which reach temperatures up to 190 Kelvin (minus 120 degrees Fahrenheit), Cassini measured surface temperatures near Enceladus' south pole as low as 52 Kelvin (minus 365 degrees Fahrenheit), and still colder temperatures are expected as winter advances. Scientists are still analyzing the data to calculate a temperature for the cross-cutting fractures and the isolated warm spot. The Cassini-Huygens mission is a cooperative project of NASA, the European Space Agency and the Italian Space Agency. The Jet Propulsion Laboratory, a division of the California Institute of Technology in Pasadena, manages the mission for NASA's Science Mission Directorate, Washington, D.C. The Cassini orbiter and its two onboard cameras were designed, developed and assembled at JPL. The imaging operations center is based at the Space Science Institute in Boulder, Colo. The composite infrared spectrometer team is based at NASA's Goddard Space Flight Center, Greenbelt, Md., where the instrument was built.